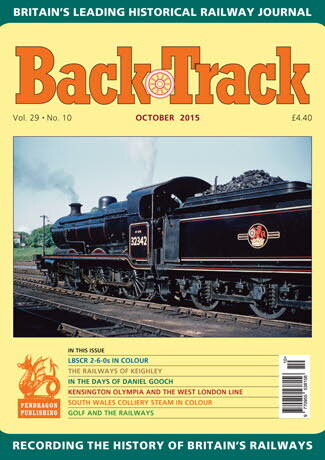 Railway Magazine | BackTrack October 2015 journal from Pendragon Publishing. Up and down the Folkestone Harbour branch - colour spread by Keith Dungate of this now-closed short but spectacular branch in the 1990s. Golf and the Railways : The Links - Part One - Beverley Cole looks at the development of the sport and the part railways played in it. Memories of a Nine Elms Fireman: Part Two - A Fond Farewell to Shed duties - the conclusion of Vernon Howard's reminiscences of footplate life. The Railways of Keighley - David Joy looks at this Yorkshire town's railway development included the Great Northern's 'Queensbury' line and the Worth Valley branch. In the Days of Daniel Gooch - L. A. Summers considers the influence of this eminent engineer in the early years of the GWR broad gauge. Brighton Moguls - colour spread of the LBSCR K Class 2-6-0s. North Staffordshire Steam - four pages of archive photographs of NSR motive power. How Green was my Valley - colour spread of South Wales colliery steam. Afternoons out of School - Robert Darlaston describes four West Midlands branch lines in the 1950s. Milk Train - Three colour shots of the now vanished milk traffic. West London Line Freight at Kensington Olympia - David J. Hayes looks back at the scene there in the 1970s. Three Southern Saloons - historic SER, LSWR and LBSCR vehicles described by Mike King. Two Caledonian Branch Trains - the Killin and Ballachulish branches photographed by David Idle.